Beautiful and meaningful ~ our delicate birthstone bar necklace includes a birthstone for each child or every member of your family. Choose between silver, gold and rose gold and customize with 2, 3, 4, 5 or 6 birthstones of those you love. 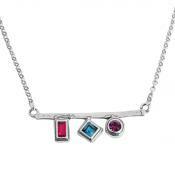 Our new birthstone bar necklace is so delicate and sweet! Bar necklaces are so popular and can be seen in fashion magazines and on celebrities. 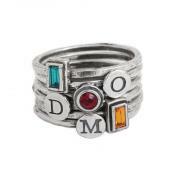 The birthstones represent each child or family member to add meaning to this simple and sophisticated design. 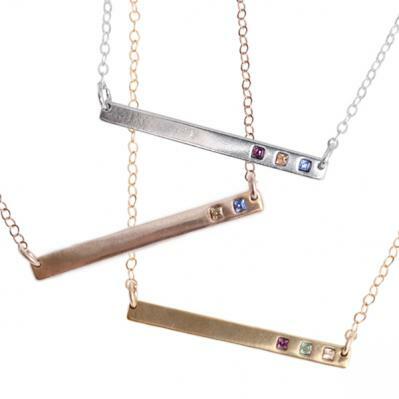 This Bar Necklace is available with two, three, four, five or six birthstones. Birthstones are 1.5mm Swarovski crystals.Metal choices for the birthstone bars are sterling silver, 24k rose gold plated, and 24k gold plate. Chains are sterling silver, rose gold filled and gold filled. Please note: Gold bar with 6 birthstones is currently out of stock. Dimensions: Bar is approx. 1.25" x .2". I was very impressed with the birthstone necklace. It is a beautiful piece, and I love the princess-cut stones. I did think the bar would be more of a matte finish, but it is shiny. That wasn't a deal-breaker for me, though. 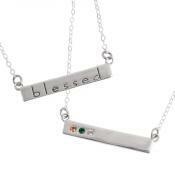 I was also impressed with the speed in which the necklace got to me. I had it a full 2 weeks before it was even expected to ship. I was expecting it to take about a month from when I ordered but received it within 2 weeks. I am very pleased with and would recommend this product!